Daughter of Bethuel, sister of Laban, and wife of Isaac (Gen. xxii. 23, xxiv. 29, 67). Abraham sent his servant Eliezer to seek a wife for Isaac. Arriving with his attendants at Aram-naharaim, Eliezer stopped near the well outside the city and declared to Yhwh that he would choose the first maiden that should offer to draw water for himself and his camels, though he should ask it only for himself. After Rebekah had drawn the water, Eliezer asked and obtained her father's and brother's consent to her departure. Rebekah remained childless for nineteen years, when she bore two sons, twins, after Isaac had besought Yhwh to remove her barrenness (Gen. xxv. 20-26). Afterward, when Isaac temporarily settled at Gerar, he and Rebekah agreed to pass as brother and sister. Abimelech, the King of Gerar, having discovered that Rebekah was Isaac's wife, under penalty of death forbade any to do them harm (Gen. xxvi. 6-11). Shortly before Isaac's death, Rebekah, moved by her preference for Jacob, induced the latter to intercept by a trick the blessing which his father had destined for his brother Esau (Gen. xxvii. 6 et seq.). Later she exhorted Jacob to flee to her brother Laban until Esau should have forgotten the injury done him. Rebekah was buried in the cave of Machpelah (Gen. xlix. 31). See Jacob. The Rabbis disagree as to the age of Rebekah at the time of her marriage to Isaac. The statement of the Seder 'Olam Rabbah (i.) and Gen. R. (lvii. 1) that Abraham was informed of Rebekah's birth when he ascended Mount Moriah for the 'Aḳedah, is interpreted by some as meaning that Rebekah was born at that time, and that consequently she was only three years old at the time of her marriage. Other rabbis, however, conclude from calculations that she was fourteen years old, and that therefore she was born eleven years before the 'Aḳedah, both numbers being found in different manuscripts of the Seder 'Olam Rabbah (comp. Tos. to Yeb. 61b). 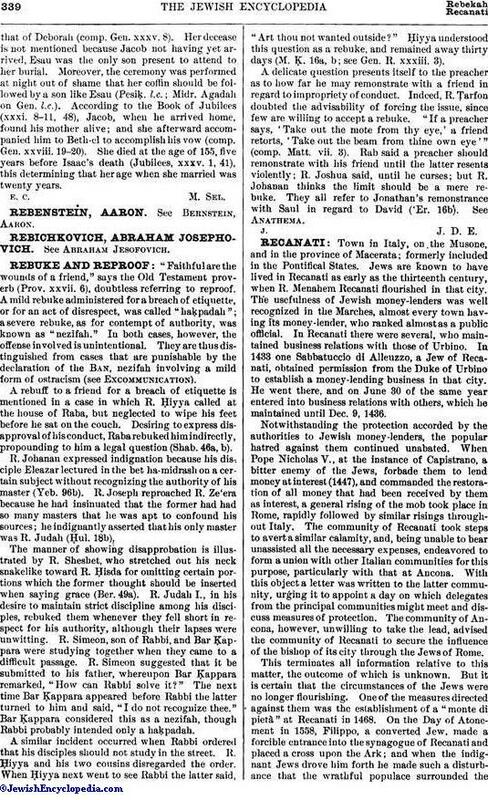 The "Sefer ha-Yashar" (section "Ḥayye Sarah," p. 38a, Leghorn, 1870) gives Rebekah's age at her marriage as ten years. From the fact that when Rebekah went down to the well the water rose toward her (Gen. R. lx. 6) Eliezer immediately recognized that she was the maiden chosen by God as lsaac's wife. The miracles which had been wrought through the virtue of Sarah and which had ceased after the latter's death, recommenced through the virtue of Rebekah (Gen. R. lx. 15) when she was taken by Isaac into his tent (Gen. xxiv. 67). Rebekah joined Isaac in prayer to God for a child, they having prostrated themselves opposite each other. Isaac prayed that the children he was destined to have might be borne by the righteous Rebekah, the latter that she might have children by Isaac only. Isaac's prayer alone was answered (comp. Gen. xxv. 21), because he was a righteous man, and the son of a righteous man, while Rebekah's whole family was wicked (Yeb. 64a; Gen. R. lxiii. 5). It is said that Rebekah, when suffering from her pregnancy (comp. Gen. xxv. 22), went from door to door, asking the women whether they had ever experienced the like. The answer she received (ib. xxv. 23) came, according to R. Eleazar b. Simcon, directly from God; R. Ḥama b. Ḥanina declares that God spoke through an angel, and R. Eleazar b. Pedat that the answer was delivered through Shem, the son of Noah, into whose bet ha-midrash Rebekah had gone to inquire (Gen. R. lxiii. 6-8). She should have borne twelve sons, fathers of twelve tribes, but through the birth of Esau she became barren again (Pesiḳ. iii. 23b; Gen. R. lxiii. 6-7). Rebekah was a prophetess; therefore she knew that Esau intended to slay Jacob after Isaac's death, and the words "Why should I be deprived also of you both in one day" (Gen. xxvii. 45) are interpreted as being her prophecy to this effect (Soṭah 13a; Gen. R. lxvii. 9). 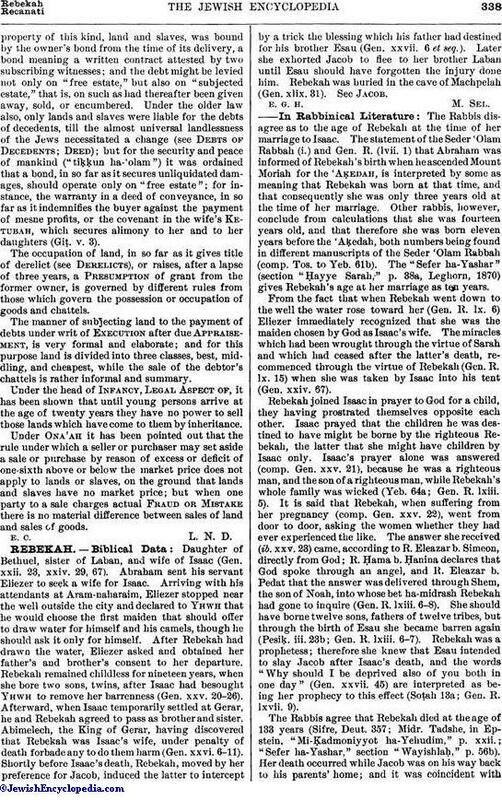 The Rabbis agree that Rebekah died at the age of 133 years (Sifre, Deut. 357; Midr. Tadshe, in Epstein. "Mi-Ḳadmoniyyot ha-Yehudim," p. xxii. ; "Sefer ha-Yashar," section "Wayishlaḥ," p. 56b). Her death occurred while Jacob was on his way back to his parents' home; and it was coincident withthat of Deborah (comp. Gen. xxxv. 8). Her decease is not mentioned because Jacob not having yet arrived, Esau was the only son present to attend to her burial. Moreover, the ceremony was performed at night out of shame that her coffin should be followed by a son like Esau (Pesiḳ. l.c. ; Midr. Agadah on Gen. l.c.). According to the Book of Jubilees (xxxi. 8-11, 48), Jacob, when he arrived home, found his mother alive; and she afterward accompanied him to Beth-el to accomplish his vow (comp. Gen. xxviii. 19-20). She died at the age of 155, five years before Isaac's death (Jubilees, xxxv. 1, 41), this determining that her age when she married was twenty years.